A Terrific Design with Variety and Great Greens. Not often can you say a course truly caters to golfers of all abilities. 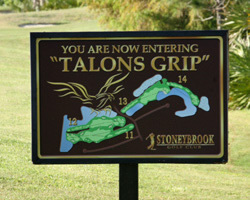 Stoneybrook Golf Club a stone’s throw from I75 in Estero, Florida is one of those facilities enjoyable to beginners and experts alike. Designed by Jed Azinger and Gordy Lewis, this facility has been certified as “Beginner Friendly,” by the National Golf Course Owners Association. 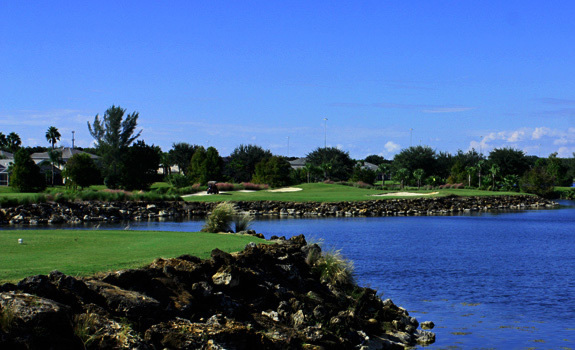 Additionally, this course has the length to be among Southwest Florida’s longest and sternest tests of golf. Providing a variety of holes, Stoneybrook is routed around natural conservation areas and having water in play on 17 holes. Whether playing a “Future,” or “Champion,” Stoneybrook is a fun, challenging experience. 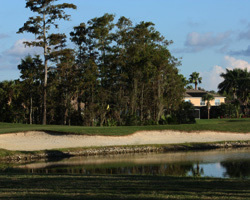 Public access and part of golf packages in the area. A course filled with this many teeing options presents many holes that make you think your way around and then have to execute. The Par 5 second is a terrific risk / reward hole; a dog-leg right guarded by numerous bunkers and a raised sloped green. Hole 8, a lengthy Par 4, is the most challenging on the course, with a pinched landing area, large trees and water to the left protecting the wicked green. The short Par 4 13th is an exacting hole with water and a huge bunker fronting the wide narrow green. Number 14 is a true beast. This short hole requiring a fairway wood or possibly even driver is more like a Par 3 and a half.